– 20 percent of children in the United States, or 14.7 million, lived in poverty in 2013. 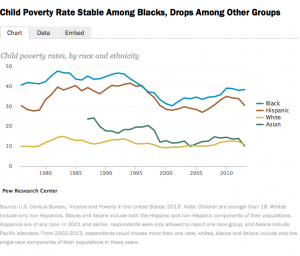 – From 2010 to 2013 the poverty rate declined for Hispanic, white and Asian children. – Black children were almost four times as likely as white or Asian children to be living in poverty in 2013, and significantly more likely than Hispanic children. – Children make up 27 percent of the black population, but 38 percent of blacks in poverty. – Children account for 33 percent of all Hispanics, but 42 percent of impoverished Hispanics. – By contrast, children make up roughly equal shares of the white and Asian populations and of whites and Asians living in poverty. Children make up a larger share of America’s impoverished than of the population as a whole — those younger than 18 make up about a quarter of the total population, but make up about a third of all Americans in poverty. In fact, the number of impoverished white children (4.1 million) may have dipped below the number of impoverished black children (4.2 million) for the first time since the U.S. Census began collecting this data in 1974. This is despite the fact that there are more than three times as many white children as black children living in the U.S. today.